Analysis: Kemp was active for all 16 regular-season games in 2018, logging 36 snaps on offense and 299 on special teams. He might have a shot at the No. 4 wide receiver job after the Chiefs lost Chris Conley earlier this offseason, but it's more likely Kemp sticks in his familiar role on the kick-coverage and return units. 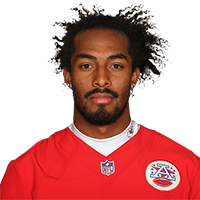 Although Kemp appeared in all 16 regular-season games for the Chiefs in 2018, nearly all of his work came on special teams. Analysis: Kemp hauled in just one pass for seven yards on two targets throughout the campaign and played more than three offensive snaps in a game just twice all season. The second-year wideout did take the field on special teams to the tune of 299 snaps, but he's far from a lock to be on the Chiefs' 53-man roster next season, despite being an exclusive rights free agent. Kemp has made the Chiefs' 53-man roster, Adam Teicher of ESPN reports. Analysis: Kemp earned a promotion to the 53-man roster in October of last season, his rookie year, which likely earned him good favor in his bid for a 53-man roster spot. He should serve as a depth option at wide receiver again in 2018 and could contribute on special teams as well. Kemp (ankle) mixed in with the first team a few times during practice Tuesday, Matt Derrick of Chiefs Digest reports. Analysis: Kemp had been sidelined by an ankle issue during practice last week, but it looks as though he's returned to the fold in short order. He's expected to challenge for a depth role again in 2018, though he only appeared in one game for the Chiefs last season. Kemp was not participating at Chiefs' training camp Thursday due to an undisclosed injury, Lynn Worthy of The Kansas City Star reports. Analysis: Kemp was not wearing pads as players began warming up and headed straight for the trainer's tent. The 22-year-old had previously been dealing with an ankle injury, but the specifics and severity of this injury are currently unknown. 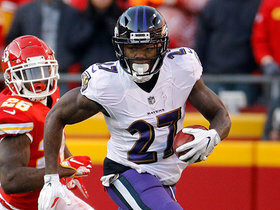 Baltimore Ravens punt returner Cyrus Jones gallups for epic 55-yard punt return.